After an incident occurred a day ago at the University Medical Center of Tirana "Mother Teresa" (UMCTMT), Infective Service, where a doctor is physically abused, some well-known doctors of this service protested asking to the Directorate of UMCTMT and the Ministry of Health quite working conditions and more security for them, as the cases of violence are increasing gradually. "We ask from the administration of QSUT and the Ministry of Health to make sure that all the medical staff of the Infective Service, especially the Emergency, but also the UMCTMT, have a safe and secure working environment. Quiet working environment means providing equipment and guards with professional guides and skills to prevent or minimize such acts," said Arjan Harxhi, chair of the Albanian Association of Infectious Diseases. Doctors demand that the aggressors in such cases receive maximum punishment, as provided by the Criminal Code. But, on the other hand, they say that because of the lack of doctors, they face severe situations and workload on capacity. "Safe and secure environment means the addition of staff working near the Emergency with doctors and nurses, especially those who deal with triazines, because the Emergency Service - especially in peak periods, such as the present flu - faces with a very large number and increased patient inflows, which exceeds the working time and this puts the staff under a tremendous stress," said Arjan Harxhi. 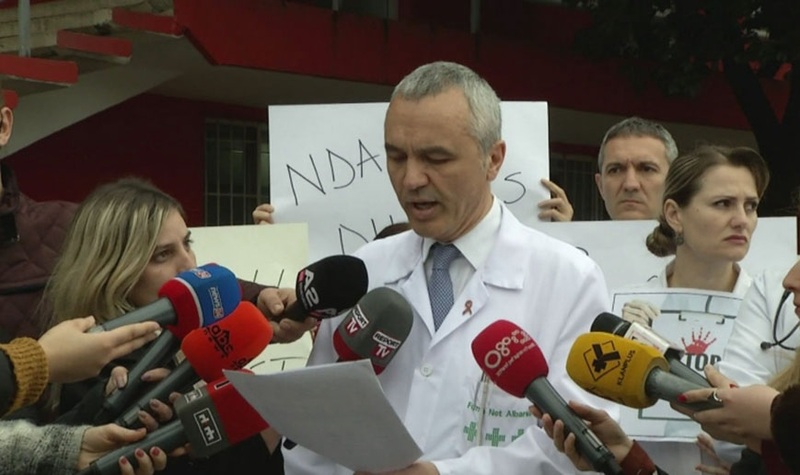 On behalf of all medical staff in this service, Harxhi states that it is time to review the legal framework and violence, and the aggression against medical personnel while working to be considered a very serious form of person's violation and to receive the maximum punishment.